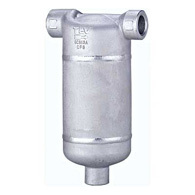 • Can be used with steam, air, and non hazardous gasses. • Stainless steel welded construction. Stainless steel construction to prevent rust. The built-in Cyclone Separator separates condensate from the flow of steam/air with a high separation efficiency of 98%. This yields improved productivity and product quality due to the resulting elimination of water hammer and the improved dryness of the supplied medium. The welded unit requires no maintenance. Steam main lines, steamers, blowers, atomizers and kneaders, and a variety of types of steam heating equipment. Processes requiring dry air, such as painting machines, and air lines. To avoid malfunctions, abnormal operation, accidents or serious injury, install properly and DO NOT use this product outside of the specification range. Local regulations may further restrict the use of this product below the conditions quoted in documentation.